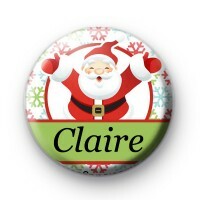 This listing is a 1 inch (25mm) pin badge with a very jolly Santa Claus in the centre surrounded by brightly coloured snowflakes & the best bit about this badge is you can add any name you like. This custom design is great for Children's Christmas Parties. School Events or just pinned to your Christmas Jumper.